Iran’s Intelligence Ministry has directly interfered in the case of imprisoned Christian convert Maryam (Nasim) Naghash Zargaran—who has been on hunger strike to persuade the authorities to consider her for early release—in another example of the Judiciary’s lack of independence. Under Iranian law, the Intelligence Ministry can only play a role in a case under direct authorization by the Judiciary. “According to Iran’s current laws, police and security forces can only enter a case during the investigative stage and they can only act as enforcement agents for the Judiciary based upon written orders of the case judge. Only in this case can they carry out a specific part of the investigation as determined by the judge; under his supervision and according to his instructions with activities such as inspection of work places or residences. After the investigations end, the case must become inaccessible to those officers,” said Norway-based human rights lawyer, Mahnaz Parakand. “In cases [involving political prisoners], all branches of government and intelligence and non-intelligence organizations unite and collectively trample the laws,” the lawyer added. 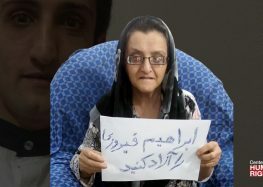 Langroudi expressed deep concern about her daughter, who has been on hunger strike for three weeks, in an interview with the Campaign on July 25: “My daughter’s physical and psychological conditions are deteriorating every day. She has been transferred to the prison infirmary twice, but she has only been hooked up to an IV. She specifically needs to be seen by a specialist outside the prison for her heart condition.”Langroudi added that her daughter was rushed to Evin Prison’s infirmary on July 20 and connected to an IV after suffering from dizziness and a drop in blood pressure. “Nasim is in really bad shape… I begged her to stop her hunger strike but she refused and said she will go on as long as she is not freed,” Langroudi told the Campaign on July 21. Zargaran, a children’s music teacher who was imprisoned for her alleged Christian missionary activities, is demanding to be considered for early release based on Iran’s New Islamic Penal Code, which allows prisoners to apply for conditional release after serving a third of their sentence. Since March 2011, Zargaran was regularly summoned and interrogated by security police about her alleged Christian missionary activities. She was eventually arrested on November 5, 2012 and accused of seeking property in northern Iran for an orphanage along with converted Christian pastor Saeed Abedini before he was also imprisoned for his religious beliefs in 2013. Abedini, an Iranian-American dual national, spent eight years in prison on proselytization charges until he was released in January 2016 along with several other Iranian-Americans following a prisoner swap deal between Iran and the United Sates.In 2013 during a trial in which she had no access to legal counsel, Zargaran was sentenced to four years in prison by Branch 28 of the Revolutionary Court presided by Judge Mohammad Moghisseh for “assembly and collusion against national security.” The Appeals Court upheld her sentence. Zargaran has been suffering from various health problems. She takes medication for heart disease that predates her incarceration, but problems with her digestive tract and spine, as well as arthritis of the neck and hands, have developed during her imprisonment, according to her mother. On June 6, 2016, while she was on hunger strike, Zargaran was granted a five-day furlough (temporary leave) that was extended until June 27. Immediately after she was returned to prison she began another hunger strike to convince the Judiciary to consider her for early release.